warmed up to operating temps? I have read reviews stating that the DT is “warm” sounding by nature. has very few hours on it. Re: A Brighter Dark Terror? Sure it’s not ear fatigue? You know, I recently thought I heard that too with mine but it wasn't all the time. I really can't say if its the amp or speakers in my cabs affected by ambient temperatures or humidity levels, or if the tubes are aging, or if its just me and my hearing. I will try to pay closer attention within the next few weeks to get a better handle on this. It could be just that. It also happens with the Micro Dark. I'm reluctant to drop a new tube in V1. I think I'm expecting Strat-like treble, but I use my Les Paul with the Dark Terror. I should experiment with my Strat. If the Strat produces the same result, then it might be my hearing. I'm going to also say ear fatigue. The whole swapping valves thing is such a unicorn so many times. My Marshall amp is very sharp and glassy to me, but that tames after playing a bit. 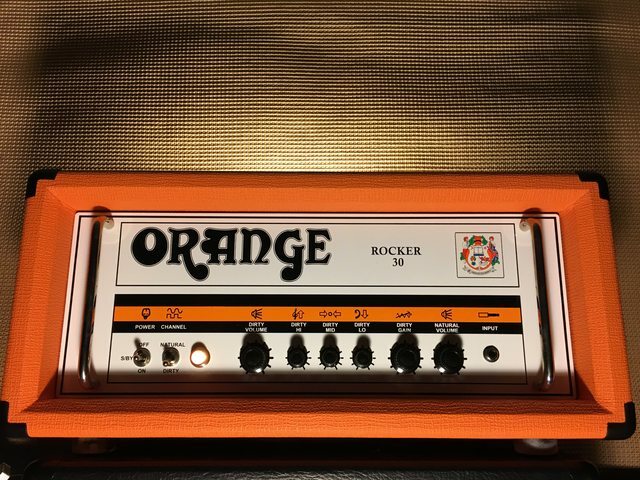 I don't have that same issue with my Oranges, egnater and blackstar amps don't have the same issue for me because of my own rubbish hearing and their generally darker tones. We all hear things so much differently, especially once we age. after 20 minutes of playing and tube warmup....just seem more subdued in the high frequencies. I eq the amp for it by how I adjust the shape control in conjunction with the amp volume and gain knobs. Even at 7watts and sometimes 15 watts, the amp is generally not producing its optimum tone when used it home. Similar to every other tube amp, it has to breathe properly to get ther and that means a larger more open practice or performance area. The whole swapping valves thing is such a unicorn so many times. I used to think so too. I also used to think (without trying any, of course) that the NOS thing was nonsense. Not anymore. I'll say it, the people listening to you at a gig will never know any better and won't notice anything beyond the fact that you (hopefully) play well and sound good. Hell, your band mate probably won't notice anything different either I'd bet, beyond the fact that you sound good. But if you were to do a straight swap between some 12AX7 from JJ, Shuguang, electro Harmonix or NOS RFT or Tungsram, you would hear some extremely clear difference. Sure those difference may be more obvious playing clean or lightly pushed (except perhaps for the RFT which sounds huge and nasty in a great way when the preamp is pushed), but in any case I was extremely surprised to see how much fuller and more detailed the RFT and Tungsram sounded. Fuller, tighter, rounder low end, more sparkle, more pleasing high end..... just amazing. And that goes clean and overdriven. I've had the same experience with NOS 6P14P EV Russian valves instead if EL84. Massive difference. I've just tried some (probably well) used RFT EL34..... they still sound better and fuller than new Tung sol I've got in my R30. Piano like low end, really tight and percussive, very sweet smooth high end..... Their crunch is huge...... and I know full well someone else got the best part of their life. They look used, and still sound better than new production valves. before with the stock tubes. I've been listening these past few weeks to bootlegs Of early Zeppelin with Page using a Telecaster. During 1969, I'm thinking he was not thinking tube brands, but more about his tone. Today I was listening closely to Zep at Filmore west in California in April that year. It sounded like his Telecaster being used and the sound was so detailed whether he played loud or soft.....lots of expression and detail and just one huge sound. It may have been his Rickenbacker amp’s, or perhaps another brand, but it sounded like Page regardless of the equipment. As far as gain and volume is concerned, what various valves can achieve is very much limited by the design of the amp really. Especially when you have 4 gain stages (already a lot), changes for more gain will be limited. These RFT ECC83 I mentioned earlier would make the biggest difference of the valves I own (similar arsenal of current production valves + the few NOS Tungsram and RFT i mentioned earlier) in terms of raw gain. What either the Tungsram or RFT would do though, is give you more defined low end, more pleasing and prominent high end, and just overall more clarity than what the others would. But if your sole aim is to have more gain, i wouldn't bother all that much and get an OD or boost that works well with your amp. Yeah, I agree with you on that, there is not much more gain that can be added on these amps by simple tube swapping, the few I've tried so far yielded results that were barely noticeable (not enough to consider worth it). The amp's tone factory wise is what attracted me to it in the first place and I am totally happy with it, good old fashioned 70s & 80s Classic/Hard Rock. I was just experimenting to see if they could be pushed a bit more without the use of pedals but yes, I do indeed use overdrives and/or a boost to push the preamp that bit more to my liking. I am fully satisfied with my 5 Orange Terrors and if nothing more it to be gained (pun intended) it does not disappointment me in any way. I get just the right amount of crunch and even cleans that I need with my playing preferences and these Orange Terrors just have that special something that makes them stand out. Enjoying reading your comments! I may yet to resort to a clean boost and not an overdrive because I like the Dark Terror's gain structure and tone. I just need to “liven” the tone up slightly without any noticeable volume increase. Have you some experience with clean boosts? I know the Pigtronix was recommend in the Orange blog. I nearly bought it last year, but changed my mind later on. I have just an MXR Micro Amp on my main pedalboard (which is all MXR-Dunlop) its not the cleanest when you go past 50% on the knob. On my 2nd board, a mix of boutique and vintage reissue pedals I have the Hotone Skyline Series Tuner which is also a 12dB clean boost (its also om my main board but out of the signal path) at the end of the preamp signal chain. It ups the volume a bit without altering the tone much.